I am going to show you how to use the free Yahoo Groups service for your email list needs. It takes about 30 minutes to set up and it is easy and free to use. First, you need to set up an account with Yahoo, even if you don’t plan on using their email system for individual emails. Then you create a new group by going to Yahoogroups.com and clicking on the Start Your Group link on the top right corner. You then give your group a category, a subcategory, and pick a name. Choose a name that is your company name or something that is short enough to be unique but still recognizable. Once you have done that, you go to the Web page that manages your group, which looks like the screenshot below. Along the left-hand side you see the Members link, click on that and then the link Invite People at the top of the page. 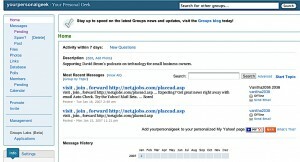 There are two ways to add email addresses to your group. One is by sending what is called an opt-in message to them. This means that the recipients have to agree to be on your list and send you back a confirmation email. The other way is to click on the Add Members link at the bottom of this page and import addresses directly into your group. This assumes that you know these people and they have already agreed to receive emails from you, such as a selected list of your customers. Yahoo only lets you add 10 people per day to the list, so this might not work for when you are building a large list. You type in the email address, first and last name on one line, then press return and type in your next name. For larger lists, see my earlier Tiplet article about using Mailman’s list services. I assume that you have already populated your list with some email addresses. Let’s take a look at what we can do with the membership list. For each recipient, you can specify one of four different delivery mechanisms: individual emails that get sent immediately when you post a new message is probably the one you want to use for most purposes and the one that people by default are given when they sign up. You can also select no emails if someone wants to remain in your database but not get emails, and a daily message summary if your list starts to get active with multiple messages posted each day. You can also set whether a person gets a plain text message or one with links and Web formatting included. Each group has one or more moderators, who are allowed to post messages and add and remove members from the list. By clicking on the edit membership link under their name you can set what they are able to do. For example, you can notify them when there are any pending messages, and when a member joins or leaves the group. 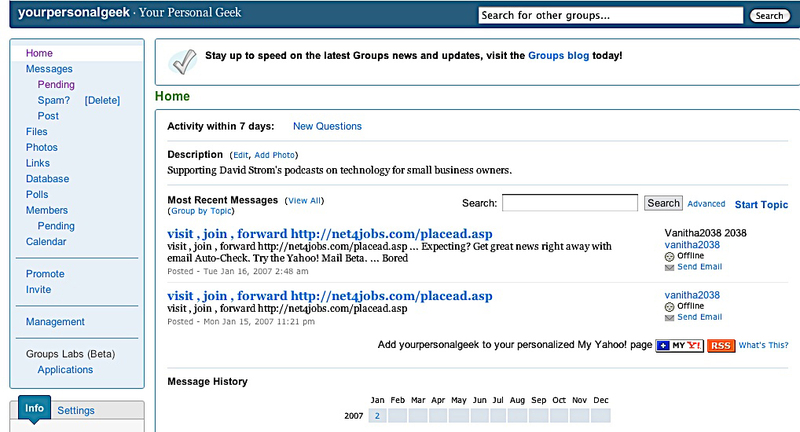 There are other features of Yahoo Groups that can be useful for businesses, such as setting up a common events calendar and posting photos. But for setting up a small email list, you can’t beat the price and the menus are fairly simple to operate.